Imagine that you are coding a Java application and creating a plain old Java object (POJO), a Java class with several private fields that will require getter and setter methods to provide access. How many lines of code will be needed to generate getters and setters for each of the fields? Moreover, adding a constructor and a toString() method will cause even more lines of code and clutter. That is a lot of boilerplate code. How about when you are utilizing Java objects that need to be closed after use, so you need to code a finally block or use try-with-resources to ensure that the object closing occurs? Adding finally block boilerplate to close objects can add a significant amount of clutter to your code. those where Project Lombok can be a great benefit. The library replaces boilerplate code with easy-to-use annotations. Best of all, the library works well with popular IDEs and provides a utility to “delombok” your code by reverting—that is, adding back all the boilerplate that was removed when the annotations were added. 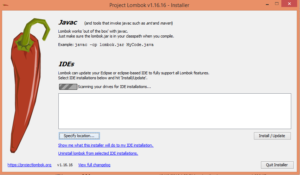 First it will search for your IDE, if not found then you have to manually make Lombok identify your IDE by using specify location button and specifying your IDE’s home directory. they are, a warning is issued and no null check is generated. to verify equality. The following code demonstrates the use of these annotations. The @Data annotation can be used to apply functionality behind all the annotations discussed thus far in this section. That is, simply annotating a class with @Data causes Lombok to generate getters and setters for each of the non static class fields and a class constructor, as well as the toString(), equals(), and hashCode() methods. It also creates a constructor that accepts any final fields or those annotated with @NonNull as arguments. Finally, it generates default toString(), equals(), and hashCode() methods that take all class fields and methods into consideration. This makes the coding of a POJO very easy. Note that if you create your own getters or setters, Lombok does not generate the code even if the annotations are present. This can be handy if you wish to develop a custom getter or setter for one or more of the class fields. in order to change it cleanly. If you’re using Lombok, you simply change the field name and move on with your life. // Whatever other options you may thing. // Empty constructor? All combinations? We can tell the tool to generate a builder pattern, preventing us to write an extra Builder class and associated fluent setter-like methods by simply adding the @Builder annotation to our ApiClientConfiguration. Easy Cleanup:- Lombok makes it easy to clean up resources as well. How often have you either forgotten to close a resource or written lots of boilerplate try-catch blocks to accommodate resource closing? Java 7 introduced the try-with-resources block to ensure your resources held by instances of anything implementing java.lang.AutoCloseable are released when exiting. Lombok provides an alternative way of achieving this, and more flexibly via @Cleanup. Use it for any local variable whose resources you want to make sure are released. No need for them to implement any particular interface, you’ll just get its close() method called. Thanks to the @Cleanup annotation, you no longer need to worry about forgetting to release a resource. Many logging frameworks are supported and of course you can customize the instance name, topic, etc.